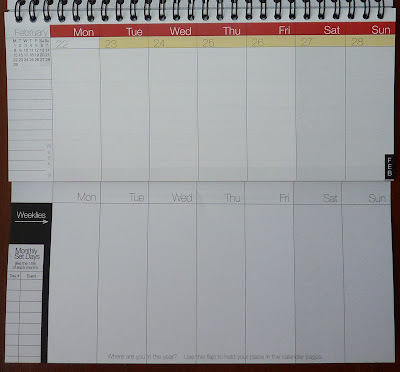 The idea behind WeekDate planners is absolutely genius. 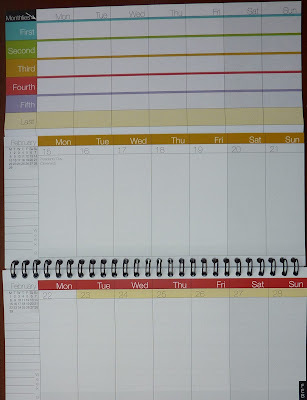 It's a paper planner with a unique design that allows you to write your recurring events only once. Anything that happens, for example, the last Thursday of each month, the first of each month, every Wednesday afternoon, whenever: you write that event in your planner just once, with no rewriting. 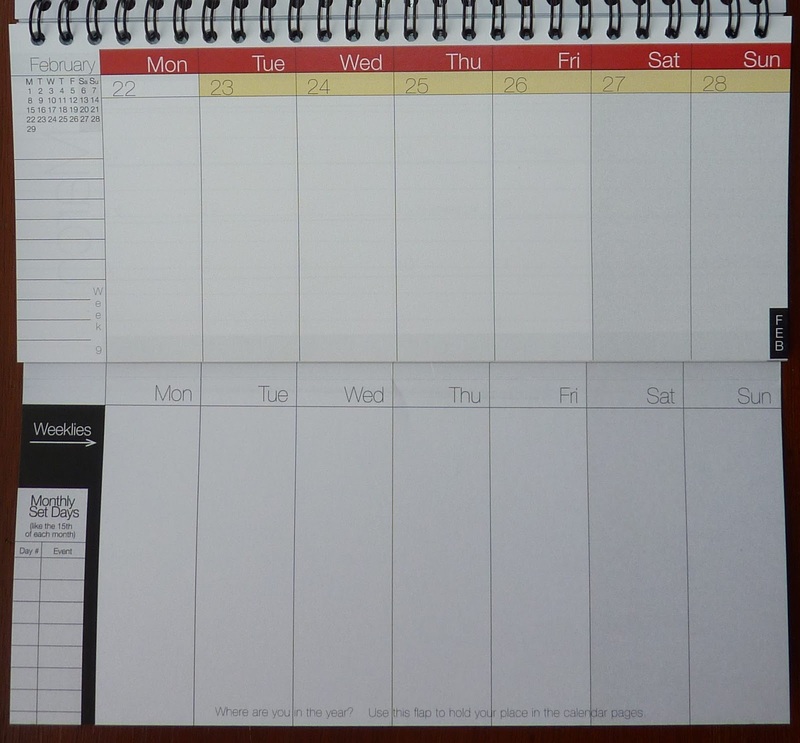 Imagine a paper planner that handles recurring events in such a simple and elegant way! 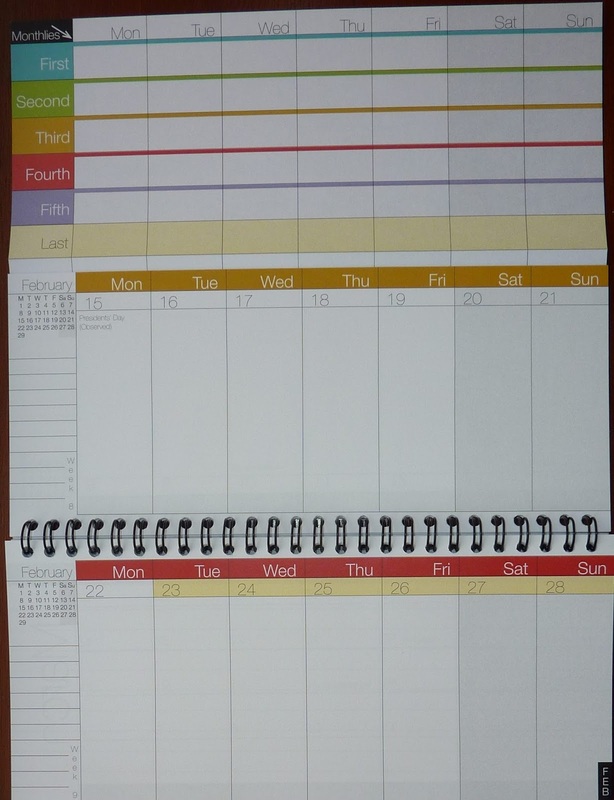 Unlike an electronic planner, it doesn't accidentally put your recurring event on every day (not just Wednesdays); it doesn't put it on the wrong day or the wrong week; and what you've entered doesn't mysteriously disappear. It all goes, and stays, exactly where you write it. Let's jump straight into the planner and I'll show you how it works. The planner is a fold-out, so when it's closed it's very slim (just a bit bigger than a checkbook) and weighs next to nothing. This is the Mind The Gap cover design, click here to see all the cover designs for the 2016 planners. The planner folds out top and bottom to allow you to see all your recurring events along with two weeks' worth of your schedule! Here is the top, showing the monthly recurring events. The color coding shows the first, second, third, fourth and fifth week of the month, and the spaces are highlighted for the last days of the month (for example if you have an event that happens on the last Thursday of every month). In the two weeks that are visible, you can see Feb 15-21 is the third week of the month, and Feb 22-28 is the fourth week of the month. Tuesday the 23rd through Sunday the 28th are highlighted as being the last of the month (the last Tuesday of the month, etc.). Monday is not highlighted because there is one more Monday in the month (29th, leap day!). Here is a view of the bottom section, showing where to write weekly recurring events. This is my favorite section, because I have a lot of weekly recurring events: my kids' after school activities, meetings, even which day to put out the trash vs. recycling. Because week numbers are printed on the pages, I can write to put the bin out on Wednesdays, even weeks is trash and odd weeks is recycling. At the bottom left is the list of Monthly Set Days. This is where you write things that happen on the same date every month, like house payment due on the first, bills due, etc. Once you've filled in your monthly and weekly recurring events and your set days, you don't have to write those items any more. Write them in pencil in case they change, then if they do you change it just once (without flipping through page after page of your planner to change each date). The weekly pages hold your daily specifics. Then everything is out in front of you all the time so nothing falls through the cracks, there's no double-booking or forgetting anything, ever! This planner is great for anyone who is busy, balancing multiple roles (work/ parenting/ school etc.) and is especially great for folks with ADD/ ADHD. There are some new features this year that I love. Here's a great one: the Time Tracker. You fill in the bubble for each day as it passes. It's a great way to see at a glance where you are in the year and how much time has elapsed. You can circle deadlines or important days in red, and see the progression as that day approaches. Another new addition this year is monthly calendars! Months are embedded in the weeks, and each month there is a notes page for goals, lists, and anything else you need to keep track of. Right now, WeekDate needs your help. 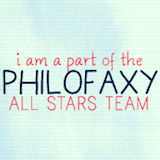 They are running a Kickstarter campaign to raise funds to help secure the future of the company, which is very small. Kay, the founder, has been doing this for awhile now and has been plugging all earnings back into the company. But in order to take the company (and products) to the next level, she needs your help to fund product development and advertising. In the Kickstarter, you can buy 2016 WeekDate planners at a discount, and can even get a special Kickstarter-only cover (which looks really cool!). So go check it out, help a great company and get yourself organized for 2016! Hi - thanks for this - I contacted Kay as I needed to know if the download 'print your own' could be made to fit a Midori TN. It seems that if she is then next year she might be able to produce a different binding that would suit a TN! What do you think? sorry - having just read my post I realise it doesn't make sense! I meant to say that if her Kickstarter was successful then she would make the TN binding a priority for next year!